When I was little, I figured out I could wake myself up from nightmares. All I had to do was squeeze my eyes shut tight, and then attempt to open them, and I'd be safely back in the waking world. Until the day I got stuck. I'm not sure why, but I think I probably have nightmares more frequently than most. In university, I was put on medication that gave me the most horrific, vivid dreams you can imagine, but even though I'm no longer on those pills I still get them. The first time I really remember experiencing sleep paralysis was at my dad's house. I had another nightmare, so I tried to wake myself up. This time, however, it didn't really work. I could see my room, the light streaming in through the curtains (I sleep in a lot ahaha) but I couldn't move. It was the scariest thing in the world, but thankfully it only lasted a couple of seconds. I did a lot of research into this, because I was convinced I was dying of course, but I soon realised I had experienced sleep paralysis. Sleep paralysis is a state in between being asleep and being awake; it is related to a disruption in the REM stage of sleep. Basically, when you are in deep sleep your body naturally becomes 'paralysed' so you don't thrash about and, in ye olde times, fall out of a tree or wherever our prehistoric ancestors were sleeping. When you have sleep paralysis, you become aware of your surroundings before your brain has really caught up - basically, you're awake but you can't move. Pretty horrific. From there, I experienced this irregularly - maybe once every six months, if that. But when I moved into a new flat with my husband in 2013, it became extreme. I started having short but regular episodes of sleep paralysis, probably once every couple of months. This coincided with a really stressful period in my work life, and things just got worse. I started getting it at least once a fortnight, if not more often, On the worst days, I'd have it two times a night. I'd wake up terrified and therefore need a nap after work, but I'd have it then, too. It was never-ending, and exhausting physically and mentally. By this point my nightmares had got to a very weird stage. You know those kind of dreams where you fall and wake up just before you hit the ground? Well I wasn't waking up. I had a dream where a gunman shot me in the heart, and instead of waking up instantly, I could actively feel the pain of the bullet and feel myself dying. When I eventually did wake up, I was petrified and had an immediate panic attack. On another occasion I felt every sensation of being in a burning room. I was stressed in real life, and that anxiety was spilling over into my sleep. One occasion stands out in particular. I woke up from a dream to find myself paralysed. My eyes were open, I was staring at the window, but I could still hear the noises from my nightmare as clearly as if they were in the room with me. I was fighting to move, when the demon who had been chasing me 'grabbed' me, dragged me off the bed and through the wall. At this point everything I could see or hear was like static and white noise. Obviously, I was massively hallucinating, but when you can see your own room, it becomes hard to separate the two. It felt so, so real. Hallucinations became a regular part of my sleep paralysis. Once, I had a 'presence' try and suffocate me with a pillow. Another time, I was 'screaming' for help when my dad walked in my room (obviously he didn't, it was a hallucination, but how bloody frustrating) but he couldn't hear me. The episodes were getting longer; minutes were passing, rather than seconds. I could feel these presences in my room, but I couldn't do anything. One fun occasion had me staring at the wall, screaming at my husband to help me. When I did eventually wake up he said he'd been able to hear me making weird noises, but thought it was just normal 'sleep noises'. It was terrifying. It started feeling like I was living in a horror movie, and I started being petrified to sleep. I felt vulnerable when I was alone in my flat, because as stupid as this sounds, but I started believing the 'demons' were real. I started noticing how often I experienced paralysis while I slept facing the wall with the window. I felt like the demons were living in the wall, and that every time I fell asleep facing that way they were able to 'attack' me. I felt like I was going crazy, like I was being possessed or targeted. I would fight the paralysis to the point of physical exhaustion, consumed by panic that I'd be stuck that way forever, but be unable to face going back to sleep. 1. Try and get into a proper sleep routine. I started tracking my 'episodes' to see what the triggers were. Staying up late was never a good idea. Even if it's hard or you're scared about sleeping, try and go to bed and wake up at the same time every day to minimise disruption to your sleep cycle. 2. Stay away from caffeine, alcohol or big meals shortly before bed. Pretty obvious one! Anything that stimulates your brain or body isn't conducive to a good eight hours of sleep. 3. Turn off your electronics! We all know that laptops, phones and tablets have a backlight that disrupts our circadian rhythm, so try and make sure you aren't using them in bed. I was always really sceptical about this, but once I started tracking it I realised I was way more likely to suffer on a night where I'd been on my phone right before bed. 4. Make sure your room is dark enough, and as quiet as possible. The room in which I suffered the most had windows looking out onto one of the busiest roads in Edinburgh. Our blinds in that room were pathetic, so it wasn't nearly dark enough. Both of these things were obviously impacting on me. My petrified logic had me believing demons lived in the wall, but from a logical point of view I realised that the light (and noise) coming into the windows was affecting my sleep when I was facing that way. 5. Try and reduce stress. For me, sleep paralysis is a major indicator of my anxiety. I have it much more frequently than I do panic attacks, but they are both linked. If there's anything at all you can do to reduce stress in your life, give it a go. I know that is easier said than done when you're scared of sleeping but have a nice lavender bubble bath before bed (I recommend A French Kiss from Lush), and try to relax. We've now moved out of that flat with the demons in the walls, and since then I have only had sleep paralyis a handful of times. Clearly, that location was not a good place for me to be living - either that, or the demons were real and haven't followed us (I make jokes but when you have sleep paralysis this does tend to be at the back of your mind!). I sleep much better now, and I can't tell you what a difference it's made to my life. 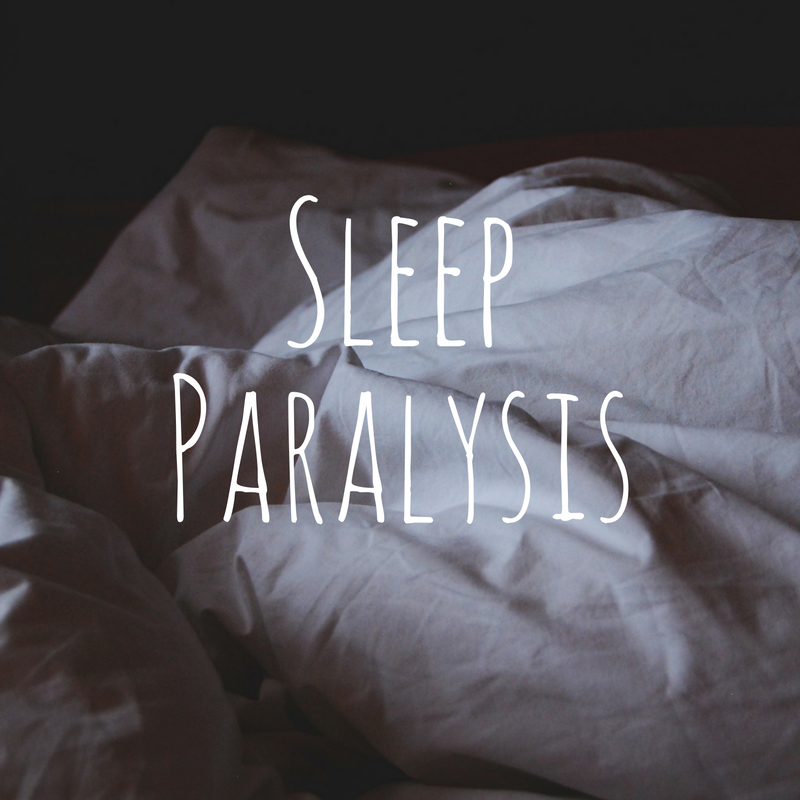 Have you ever suffered from sleep paralysis? I'd love to hear your experiences.